(CNN) -- Severe turbulence shook a Continental Airlines flight Monday, injuring dozens of passengers and forcing the aircraft to divert to Miami, Florida, according to the airline and a fire official. 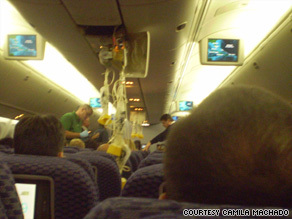 Oxygen masks hang from a damaged part of the plane Monday, in a photo by passenger Camila Machado. "I've never seen turbulence like that, so I really thought we wouldn't make it," passenger Giovani Loss told CNN affiliate WSVN-TV. Loss, who is originally from Brazil, said he is a lawyer in the United States and frequently travels between the two countries. "People [were] screaming, then there was a huge silence for like 30 minutes," Loss said. "People that weren't seat belted in flew up and hit the ceilings," passenger John Norwood told WSVN. "So their faces, their heads hit the plastics and broke all the plastics up top." The flight is scheduled to depart Miami for Houston later in the morning, according to Continental's Web site. It had been scheduled to arrive in Houston at 6 a.m. local time.